Co-ops, agricultural product dealers, county extension agents, town governments, fire and police departments, as well as individual farmers can benefit from our town, country and other large-scale maps. These maps can be highly customized to fit many needs. County maps can be created using aerial photographs as background, and include labeled roads, town boundaries, streams, and other data. Typical county maps are created with a scale of 1 inch equals 1 mile or less. Using this scale with the photograph allows the maximum coverage area while retaining the ability to pick out individual buildings in the photographs. Adding labeled roads and streams to the photos on such a map can help people unfamiliar with the area to recognize landmarks before leaving the office, making locating fields, businesses, or other places easier. Town maps would typically be at a larger scale than county maps. Such maps would also include labeled roads and streams. Additional layers that could be useful to town planners may include street sign locations and types, manhole cover locations, electric substations, water and gas lines, as well as many others. Fire and police departments can also benefit from such maps. These maps could include fire hydrant locations, business vs. residential area classifications, hazardous material storage locations, and others. Evacuation areas and/or danger zones from chemical spills could also be created using advanced modeling techniques for both airborne and water contaminants. Agricultural product dealers maps would generally start with a base map with labeled roads and streams. Additional layers (including the aerial photographs) can vary depending upon the products and services offered. Fertilizer dealers may want maps with the locations, names, and sizes of all fields that they service. Seed dealers might desire a map showing customer locations. 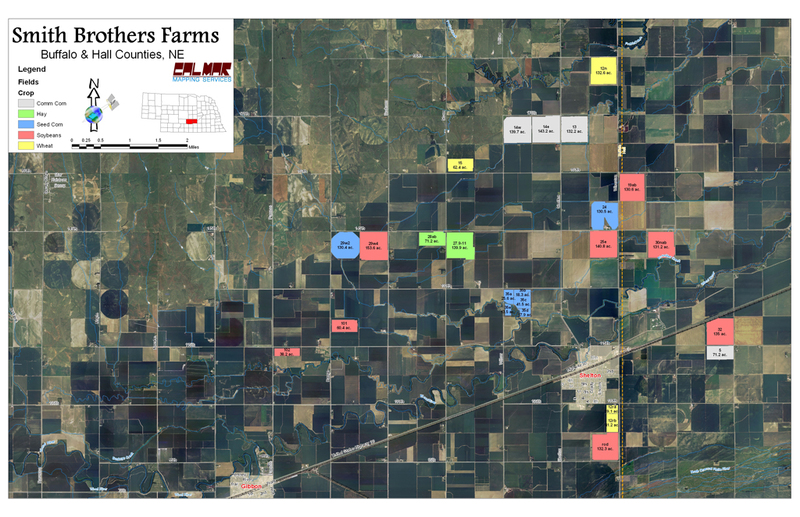 Farmers with a large number of acres might benefit from a map of their operation. These maps could include layers such as field boundaries, field names/numbers, acres, crop type, crop rotation, landowner name, etc. These maps can help in planning field operations and scheduling, especially on farms where seasonal laborers unfamiliar with the farm and fields are concerned. We can make county and town maps for any area in Ohio, Indiana, Illinois, Kentucky, Missouri, and Iowa. We can also make maps for some areas of Michigan, North Dakota, South Dakota, and Minnesota. We can also make maps for other areas, but aerial background imagery is not available.